I have somewhat of a small obsession with house plants. My house however, does not want me to indulge myself by being dark and prone to damp, which are not the best conditions by any stretch of the imagination. I keep trying in the vain hope that one day my home will resemble a forest-come-desert, but for the time being I am littering my window ledges with tiny pots of low maintenance succulents and cacti. I have a growing collection of teacups and seeing as I can't use them all at once, I thought I would repurpose them as little planters. 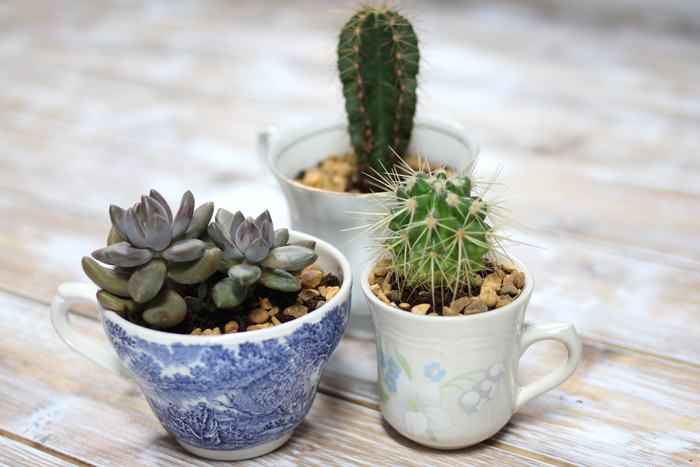 I also have some, what I assume to be coffee cups, but seeing as I don't drink coffee (yes I know) I thought I'd use one of them to house a cactus too. 1. Pour a layer of pebbles onto the bottom of each teacup. This is to provide drainage and to stop the plants from becoming waterlogged. 2. Cover the pebbles with a layer of compost. I used as spoon to make this a little less messy. 3. 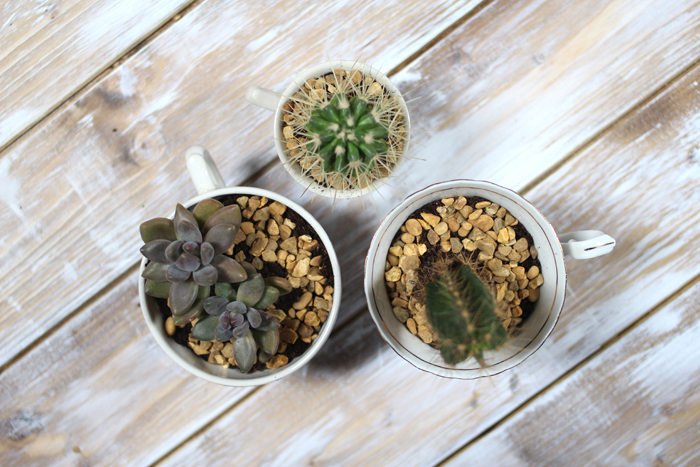 If you're using cacti, you may want to wear gardening gloves for this next step! 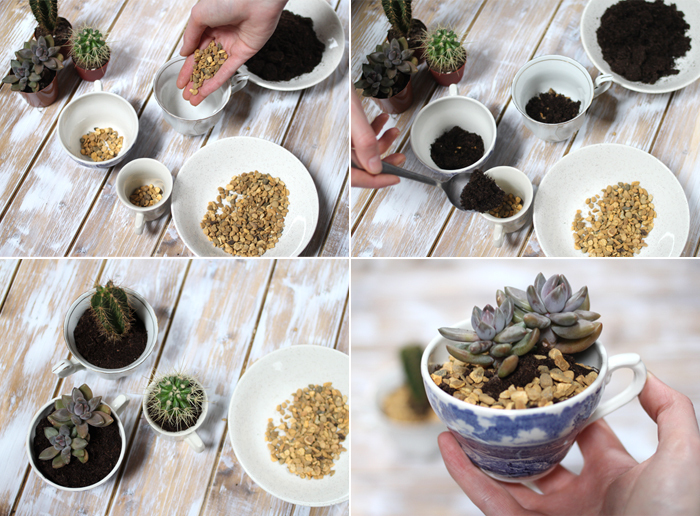 Unpot the plants and place in the centre of each teacup, then pour enough compost around the plants until the compost is level. Pat down and add more compost if necessary to ensure the plant is secure. 4. 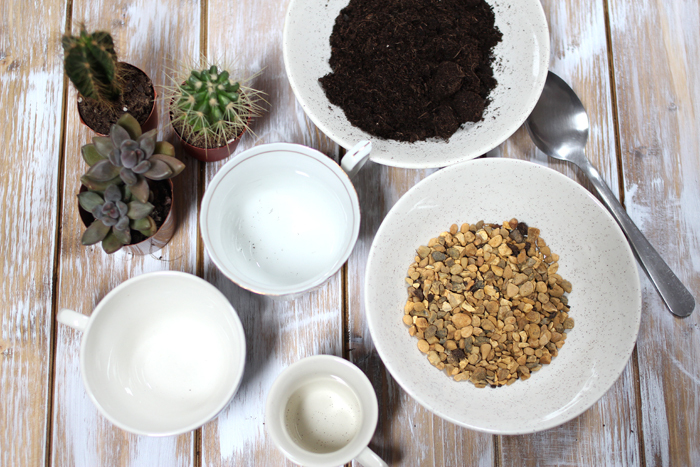 Optionally you can sprinkle a layer of pebbles on top of the compost to finish. 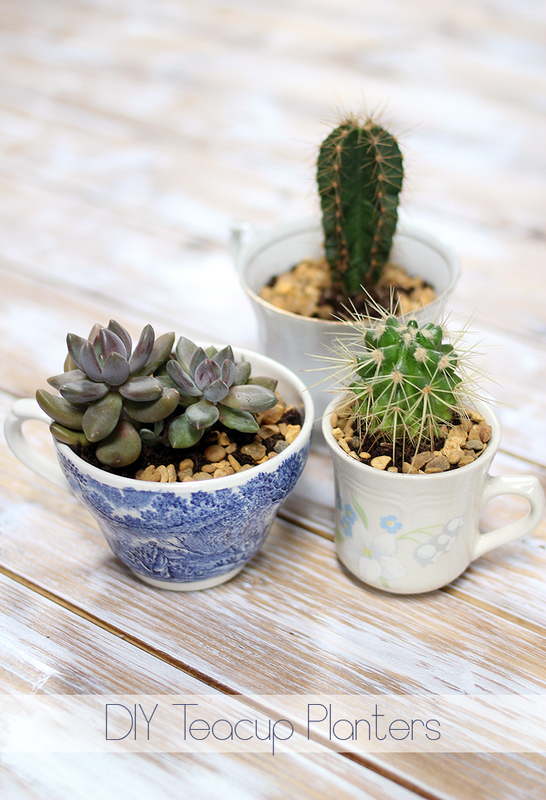 These little planters make a great alternative to a traditional pot and look really lovely grouped together especially if the cups are mismatched. Alternatively, they would also make great gifts, especially for a tea lover. So cute! I'm trying to add more succulents and cacti into my house plant collection since I seem to kill everything else. I love this!! Can't wait to try with my littles- thank you for the inspiration and know how! I'm definitely using this for my next apartment! I love this! I have plenty of tea cups and coffee mugs (some might say too many) and a cactus that needs a pot. I might use this tutorial for my new cactus!